Another week comes with the most popular from our roundups. Make yourself comfortable and read these 10 Most Inspiring Productivity Articles from this week, chosen by our team! Our blog is a place where we provide all the productivity and time management knowledge. We try to do that by writing and posting worth reading articles full of useful tips and lifehacks. Self and work time improvement is our priority, so we want to inspire all our readers and motivate them to start to increase their time management skills and make them more productive. Because our lives cannot be filled just with dull moments without any will of life. Let’s stop with saying “no” to improvement – say “no” to the weakness! As a result, we created a cycle of productivity and time management, as well as about self-improvement. 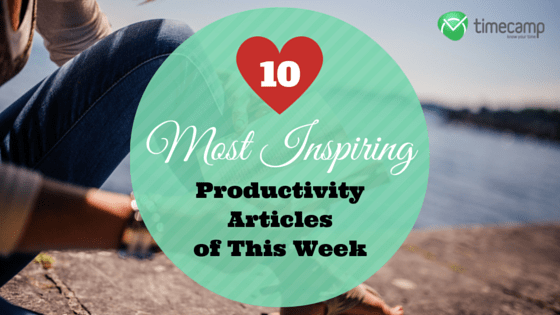 Don’t hesitate – just read best productivity articles from the passing week! An Essential Set of Tools for Productivity at Work – by Todd B. Kashdan Ph.D. If you want to send us your favorite productivity articles, time management, and self-improvement articles, please feel free to do it. Tell us about them in comments! Tell us about them in comments! Staying productive is one of the most important the success factors. How to accelerate it? Choose a reliable and proven tool! Interesting! Great Ideas. Worth to share!